Thank you to everyone who was concerned about me after the Christchurch earthquake. We are OK. We were in no danger, and we didn’t even feel anything. Today began like an ordinary day. I weeded the garden, and I did a load of washing. I was going to go to the supermarket, and I intended to write a post on my blog (now postponed). After lunch, Five’s school rang. Five had a sore throat. He wanted to come home. When Five and I returned home, I read on Twitter about a 6.3-magnitude earthquake in the city of Christchurch. It quickly became clear that Christchurch had suffered a devastating quake. Christchurch is in the South Island, about 200 miles from where we live (up the coast from Wellington in the North Island). 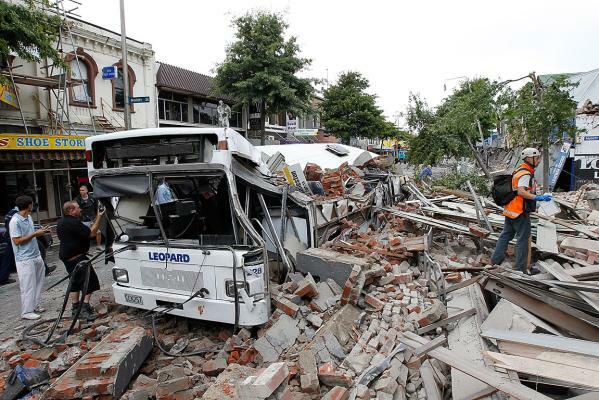 After a massive quake in September, Christchurch has suffered many aftershocks. Despite only being a 6.3, today’s quake was more severe than the September quake. It was closer (only about six miles from the centre of the city) and shallower (only three miles underground), and it occurred at lunchtime—when the city was full. At the time of writing 65 people have been confirmed dead. The number of fatalities is certain to rise. Rescue workers are working through the night, trying to save people who are still trapped. Since we are only a small country of about 4 million, in times of crisis, it really feels like family. Across the nation our hearts are aching. I actually can't believe it - I woke up this morning and was completely heartbroken for Christchurch. After September this just seems too much, really. Still, I love how New Zealand as a country is rallying around Chch, and providing as much support as possible. From individuals to large kiwi companies like Orcon + AirNZ. Makes me really proud to be a kiwi. I'm glad to know you're fine. How awful for the people of Christchurch who have already endured so much. I'm glad you're okay. I've been away from the news for the most part, researching my family tree, and just this morning was able to see on one of the morning news programs what was happening in NZ. I sat on my couch crying as I watched it. Thank you for the description of the distance from where you are and Christchurch. Of course we are staying tuned to news. Glad you are ok. Praying for the people effected. The feeling today, even for those of us away from all the action, is simply surreal. I used to work for a Christchurch-based company and the building behind them is one that had more than 30 people trapped in it overnight. I feel incredibly helpless sitting at my desk in another city and trying to operate as normal when there are so many people I know who can't do this. Tragic. As of this writing from L.A. the death toll is 75. I was trying to remember out last earthquake and I don't remember there being a huge death toll. I guess you never realize how lucky you are sometimes. I was so glad when I saw you were OK, but also so sad at this terrible tragedy. Really shocking and so sad. I think what Elly says is so true... the heart warming thing is that Kiwi are digging in and helping each other so much. Take care.